It’s 38, with a B. So, you have FlipKart, SnapDeal, Myntra, and many more but the market is only beginning to take shape. For the small business owners in India, there’s humongous potential. There are tons of niches that can still go online exclusively. We are a digital marketing agency in India, and that puts us in a really strange spot: We have the whole world to serve, but not much happens where our roots really are. Yes, this is in the face of a booming ecommerce scene, and a fantastic opportunity for more businesses to thrive. Many SaaS tools, web apps, and many shopping platforms (include popular website builders which allow for eCommerce) cater to U.S, Canada, and a few other countries. India is almost always out of the equation (despite the growth and opportunity). While the perennial search for the best ecommerce platforms continues, it’s an exciting time to be in business. With so many options to choose from, however, it could be a serious pain just trying to choose one to begin with. We have some of the best and the greatest options available already: from the ever so simple ones to gigantic ecommerce platforms such as Shopify. However, ever so often, I get the privilege of getting in touch with some UberCool startups with some degree of focus on India. Shenaz Bapooji, CMO of Shopmatic Group (India), believes that India has tremendous potential with ecommerce. She believes that the small businesses in India haven’t even woken up to the real opportunity ecommerce is. If you are not spending 48 hours a day thinking work, then you’ve not joined Ecommerce. If you’ve worked with any of the Indian “build your ecommerce site” solutions, you’d realize that it’s not cakewalk. There’s just too much going on. I tried signing up with Instamojo and it felt more like I was filing my taxes. Forms, and some more forms. Most other platforms are just as cantakerous, if not, soul-sucking. Shopify always ends up being my default choice to setup a store for clients. That was until Shopmatic came along which really has clean interface, amazing design, and it’s very easy to set up. 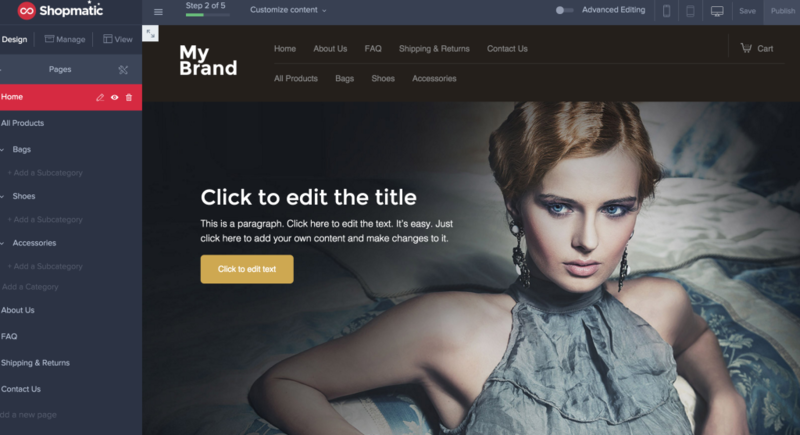 The templates look fantastic and are even better than any web designer or developer can ever give you. Tweak header, footer, layout, forms, elements, and more. At the moment, I don’t see the ability to export code or do any extreme customization but I also don’t see any reason why you should bother. A few clicks, one payment (with a choice of three plans – 1 month, 6 months, and 12 months), and you are good to go live. 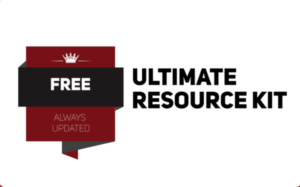 A choice of 50 industry-specific templates for you to choose from, also optimized for mobile and responsive. A single dashboard to manage your business from. 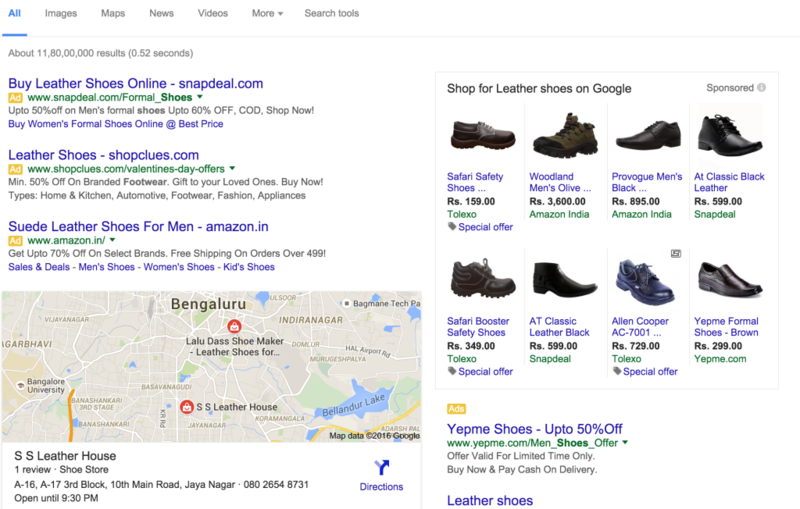 If you are looking to setup an ecommerce store in India, you’ll do better to display your prices in Rupees. It’s surprising how many “ecommerce store solutions” ignore simple things like GeoIP or customizing content to reflect visiting audience. 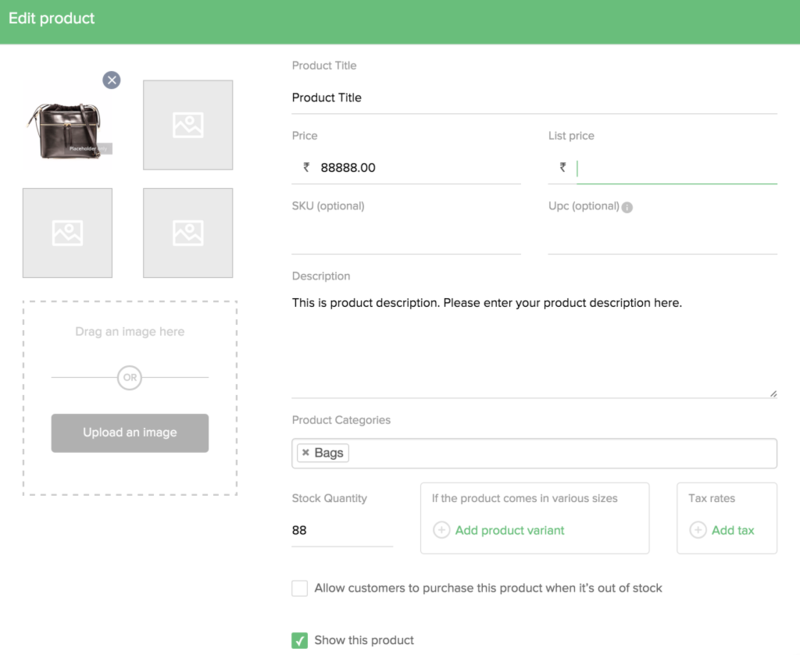 When you are out to setup products, you’d see that you can easily setup your list price, images, SKU, add tax rates (if any), specify quantities, add descriptions (product copy), and add tags. Repeat this for every product on your inventory and you are set. Bonus 1: Why You Should Stop Shopping & Get to Work Instead? The biggest problems you have, as a business owner, are information overload and the paradox of choice. You’d spend way too much time just trying to decide which platform to use for your ecommerce business. I agree that it’s an important decision to make but it’s not as important as “starting up” first. Ecommerce platform like Shopmatic or Shopify take care of hosting, security, and regular maintenance. They come secure, out of the box. The reason why these tools exist is to help you “not” worry about the choice you make with respect to ecommerce platforms but instead focus on what your business really needs: marketing and conversions. Put your energy into marketing and work to grow your conversions and sales over time. Digital marketing already takes a tremendous amount of energy and time and you don’t want to sit and knock on the tables wondering why sales don’t happen. Read my post on why you should focus on the entire digital marketing spectrum and not just SEO or social media. Now, If you are in India, you are likely to hear all sorts of stories about digital marketing (since everyone is an expert). The fastest and the most effective way to promote your new ecommerce store is with Google Adwords. More specifically, it’s Google Shopping Ads. The best part of doing ads with Google is that you will start showing up for relevant searches on day 1 (unlike SEO which takes months). Plus, you choose your budget, control your ad spend, and you also have the ability to continuous test your ads (A/B testing). Try out Shopmatic For Free. See what It can do for that ever-thinking, Idea-hatching brain of yours.